The Jungle Effect is written by Daphne Miller, MD, a board certified family physician with an interest in nutrition and preventative medicine. In this book she explores the dietary wisdom of traditional cultures so that modern people can learn the secrets of a longer and healthier life. Miller traveled to a variety of locations around the world that she identified as ‘cold spots’ for specific diseases. These were areas that had a remarkably low incidence of diseases such as diabetes, heart disease, depression, colon cancer, breast cancer and prostate cancer. She focused her attention on the traditional foods that were consumed in each ‘cold spot’ so as to discover the ingredients and recipes that truly maintain health and prevent or treat chronic disease. Miller outlines the specific foods, combinations and preparation methods in each ‘cold spot’. Dieters can follow the guidelines for one region in order to prevent or treat the associated disease. Alternatively you can mix and match ingredients and recipes from different regions if you are interested in addressing more than one condition. For example, Crete is a ‘cold spot’ for heart disease and the foods that should be emphasized to reduce the risk of heart problems include olive oil, whole grains, legumes, red wine and leafy green vegetables. At the end of each chapter Miller provides guidelines from a basic to advanced level that will enable you to achieve the greatest benefits related to each region. She outlines recommended intakes of specific foods as well as lifestyle advice including those relating to physical activity and psychological strategies. Corn, beans, squash, peppers, nopal cactus, onions, cilantro, tomato, jicama, nuts, avocado. Olive oil, chickpeas, lentils, whole grain pasta, potatoes, Swiss chard, kale, arugula, fish, red wine, figs, walnuts. Fish, walnuts, purslane, flaxseed oil, barley, rye, black tea, beans, split peas, potatoes, organic dairy products, omega 3 enriched eggs, wild game, cabbage, bilberries. Millet, teff, collard greens, mustard greens, spinach, okra, plantains, beans, nuts, fish, wild poultry and game, onions, tomato, banana, yogurt, kefir, fermented vegetables. Tofu, tempeh, miso, fish, cabbage, bok choy, broccoli, kale, cauliflower, brown rice, green tea, sea vegetables, sweet potato, mushrooms, tomato, watermelon, grapefruit. The following meal plan is based on the recommendations for Crete, Greece, which are aimed at reducing the risk of heart disease. All of the traditional cultures had a high level of physical activity, most of which was related to gathering food and farming. The general recommendations are to do some form of aerobic exercise for at least thirty minutes, four days a week. Walking and gardening are also acceptable forms of exercise. The Jungle Effect retails at $14.99. Includes interesting descriptions of the lifestyle of different cultures and of the individuals that the author encountered during her journeys. Addresses aspects of lifestyle that are related to preventative health. Includes recipes for each disease ‘cold spot’. Recommendations may not be precise enough to treat or prevent specific diseases. 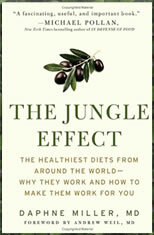 The Jungle Effect gives readers an interesting look into some of the healthiest diets around the world, while providing practical information that will allow dieters to benefit from the facts that are presented. By incorporating the diet and lifestyle recommendations most dieters will achieve health improvements and a reduced risk of developing chronic illness. However for those with already established disease or a high risk factor of a certain condition the program may not be detailed enough in order to support optimal results. This diet really works. My family has a history of colon cancer and this diet seems to be working. I am very glad that I found this book. I followed the instructions and got the reccomended amount of physical exercise. Thank you, Daphne Miller for you’re fantastic book!